Two books designed by Darlene in 2015. This week in the mail, I separately received physical copies of both books I designed in 2015 for two different authors and the subjects could not be more different from each other. The first book project, a behemoth 336-page hardcover, “Mythos Arcanum” (written by Joe Aragon, published by MAGI), was completed and signed off by me during the summer of 2015. Thanks to a successful Kickstarter campaign, I created the lion’s share of the illustrations. I am surprised at the amount of time it took for the actual printed product to appear. MAGI took the route of having a traditional print run. 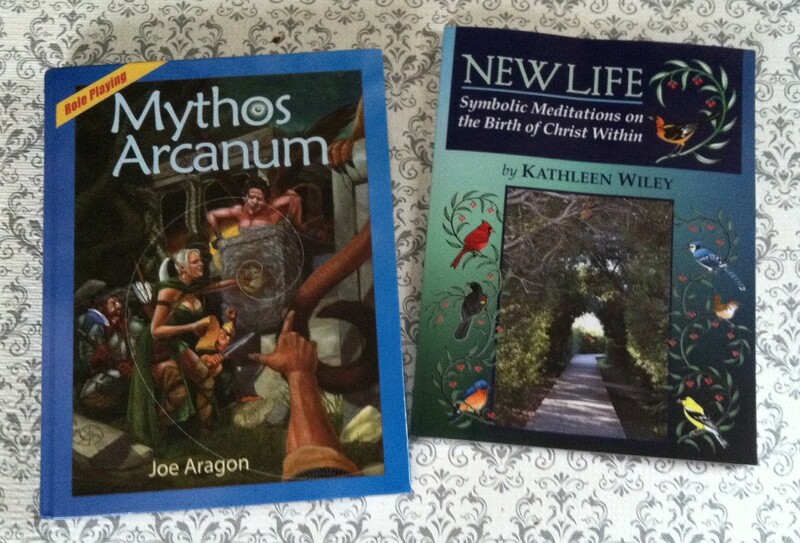 I started my second book design, “NEW LIFE: Symbolic Meditations on the Birth of Christ Within” (written by Kathleen Wiley and published by Soulful Living, Inc.), immediately after the first book was put to bed. I spot-illustrated this 98-page soft cover with line art of different birds and signed off on Kathleen’s book last week. Then I prepared the book for publication through a digital vendor and it took only about a week to become available. That’s how I received physical copies of both books in the same week. The difference in the time factor astounds me. When looking at each title, side by side, it is difficult to believe they have anything in common. Yet I designed both books to conform to the principles of the phi ratio. Now, the first edition of Kathleen’s book had already been publicly available for two years. But a good friend of ours (who had helped me proof read Mythos Arcanum) recommended to her friend Kathleen that she consider having her book redesigned by me, using the golden mean. When I first contacted Kathleen, mid-August 2015, about a possible re-design, I wrote: “To most people, in and of itself, a page of words is just a page of words. Anyone, even those without an aesthetic sense, can create perfectly reasonable page presentations from templates. But there is no life, no sparkle or soul to an uninviting wall of words. When the eyes get tired, reading becomes a chore and comprehension suffers. To rest the eyes, the book gets put down, producing an unconscious psychological resistance. It’s harder for the reader to resume. Without a compelling incentive, the book may never get picked up again. And that is sad, for both reader and author. My passion is to create a thing of beauty. Beauty speaks. Eloquently. With book design, my facility is to create a visual portal through which people may more easily access the depth of the ideas being expressed. It’s like opening a gateway to a different world. Resonance is achieved through the subtle balance of negative (white) space, text, and graphics using correct proportion and placement. It is my gift, my genius. Its only been a couple of weeks since Kathleen’s second edition has been available and already it has generated some notable buzz. For instance, she showed up at a bookstore in her town and inquired if they were interested in selling the book of a local author. They were so she left some copies behind. Before the day was out (or at least a short time thereafter), the bookstore called and offered to promote her book and do an author signing. They are even willing for Kathleen to do talks and give classes about her material through the bookstore on a monthly basis. I’d venture to say the book cover design worked in her favor. It is a joy to see how Kathleen’s star is now rising. I am so pleased to have been an integral part of her success. Kathleen is now anxious for me to begin design work on a second title of hers and I’ve already started. The publication of Joe Aragon’s book will be officially announced on December 5th, 2015. I trust that Mythos Arcanum will receive similar notoriety albeit from a different audience. Only time will tell. I’ve decided to submit this book to an RPG design competition. Because good design has mostly not been a large consideration within the Role Playing Game industry, I am more than curious to see how well aesthetics can be recognized and honored. This entry was posted in For the LOVE of BOOKS, Recent Events, The Creative Process and tagged book design, book publishing, golden mean, joe Aragon, Kathleen Wiley, phi on November 21, 2015 by Darlene.